A growing group in San Diego is flipping the script on those who fight dense development in their own backyards. 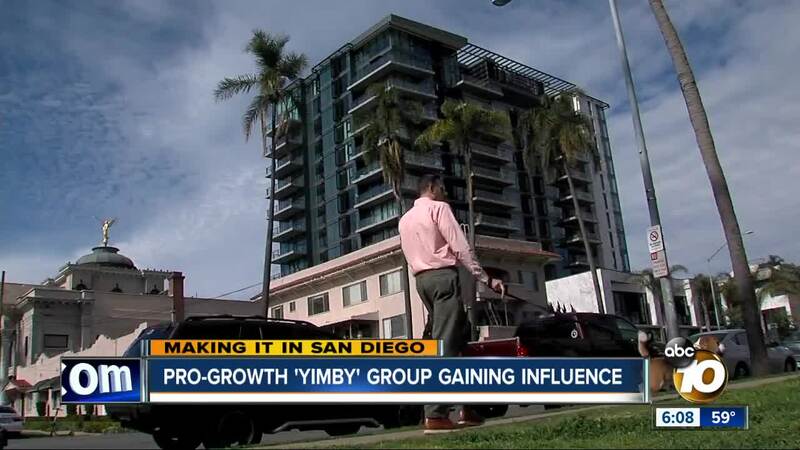 SAN DIEGO (KGTV) — A growing group in San Diego is flipping the script on those who fight dense development in their own backyards. They're calling themselves the 'YIMBY' Democrats. YIMBY for "yes in my backyard." Their solution is for more dense development in urban areas where people can live and work. They also seek legislative reform and developments that help combat climate change. "It's basic supply and demand," said member Dike Anyiwo. "The more sort of inventory that we're able to produce and build and create, then it stands to reason that prices should go down." Their ideas appear to be gaining traction. The city recently passed Mayor Kevin Faulconer's plan eliminating parking requirements near transit centers. And the YIMBYs are getting visits from some key politicians, including Assemblyman Todd Gloria, City Councilmembers Monica Montgomery and Chris Ward, and County Supervisor Nathan Fletcher. Plus, some of its members are now landing spots on city planning groups. Anyiwo is now on the Midway Pacific Highway Community Planning Group. Still, concerns remain that the YIMBY plans could lead to too much crowding for the city's infrastructure. "Where's all the water going to come from? What are we going to do about all the needed extra police and fire protection safety?" said Mat Wahlstrom, who recently lost his seat on the Uptown Planning Board for a slate of pro-growth candidates. Wahlstrom, a Democrat, also expressed concern that the YIMBY's would adhere to developer wishes. Anyiwo said while some YIMBY Democrats may in-fact be developers, the group's mission is people first, and that progress needs to happen.